(CBS News) Five men have been arrested after a months-long sting operation, charged with plotting to blow up a bridge in the Cleveland area, the FBI announced Tuesday. CBS News senior correspondent John Miller reports the group had been involved in a series of escalating plots that ended with their arrest last night by FBI agents. 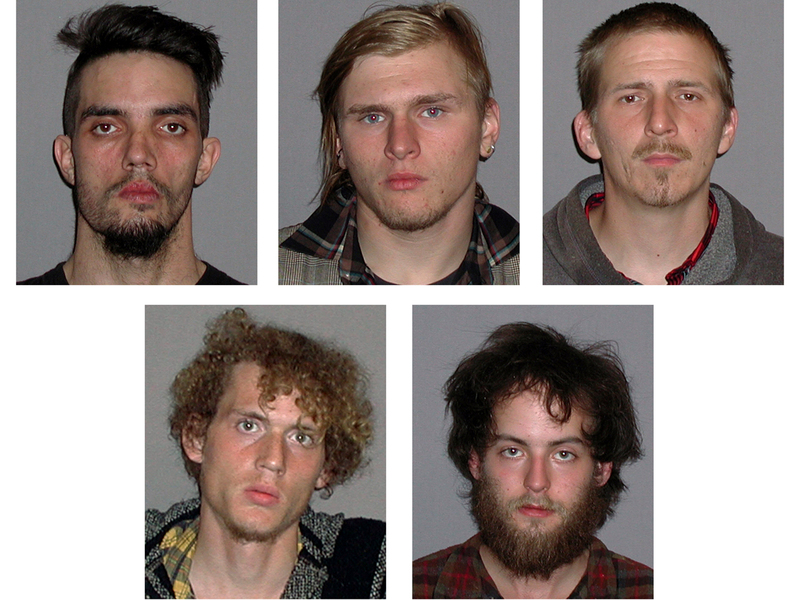 The sting operation supplied men, some of whom were alleged to be anarchists, with what they thought were explosives and bomb-making materials. At no time during the case was the public in danger, the FBI said. Douglas L. Wright, 26; Brandon L. Baxter, 20; and Anthony Hayne, 35, were arrested by members of the FBI's Joint Terrorism Task Force Monday night on charges of conspiracy and attempted use of explosive materials to damage physical property affecting interstate commerce. Also arrested were Connor C. Stevens, 20, and Joshua S. Stafford, 23. The criminal complaint was filed this morning in U.S. District Court in Cleveland. According to law enforcement sources, the five were not connected to international terrorism. "The initial plot involved the use of smoke grenades to distract law enforcement in order for the co-conspirators to topple financial institution signs atop high rise buildings in downtown Cleveland," the complaint reads. The FBI says over the course of several months the accused discussed various targets in and around the Cleveland metropolitan area, with the Route 82 Brecksville-Northfield High Level Bridge being selected as the target. The bridge crosses over Cuyahoga Valley National Park from Brecksville to Sagamore Hills. The defendants then conspired to obtain C-4 explosives, contained in two improvised explosive devices (IEDs), to be remotely detonated, the FBI said. "The individuals charged in this plot were intent on using violence to express their ideological views," said FBI Special Agent Stephen D. Anthony. The five defendants are expected to appear today before a federal magistrate in U.S. District Court in Cleveland. According to the affidavit, Wright (who described himself to an FBI source as an anarchist of long standing) had recruited other young men to his circle who were planning to set off smoke bombs at a bridge in Cleveland as a diversion while they brought down the signs atop buildings in the city. The complaint said while the group had not figured out how they would demolish the signs, according to Wright, "the signs are the most important part [of the plan] because they need to make sure everyone knows that the action was against corporate America and the financial system, and not just some random acts." Wright also allegedly complained to the FBI source that "there were not enough anarchists in Cleveland to do what he wanted to do." An undercover employee who has worked with the FBI for 15 was cited in the affidavit, as was a "confidential human source" (CHS) who reported on the group's meetings. The complaint notes that the CHS has a criminal record, including convictions for cocaine possession, robbery and passing bad checks. Since July 20, 2011, when the source began working with the FBI, the agency paid this source more than $6,000 for services and expenses. The CHS said that Wright offered to show him how to construct smoke bombs, based on recipes from "The Anarchist Cookbook," and was looking to purchase a retractable baton at a gun show or Army-Navy surplus store. In a meeting in April 2012 the group was still unclear on the target bridge. According to the CHS, Baxter said taking out a bridge "was a good plan, but he did not know how the general public would take it, and he did not think the media would portray that in a good way." Baxter claimed to have acquired eight pounds of C-4 explosive, and suggested they look for a neo-Nazi or Klan headquarters in Ohio to blow up. Wright suggested blowing up a Federal Reserve bank with a car bomb. He also allegedly said he would consider wearing a suicide vest but would have to be "very drunk" to go through with it.